Two comics a day two days in a row. Wow. This is not going to happen again tomorrow. I can't spew ideas out like that. Eventually I will probably adopt the MWF schedule that everybody else seems to have. Anyway this is the second comic in the Cueballs series. ooh I have a series...sounds professional lol. This is very good and mysterious. 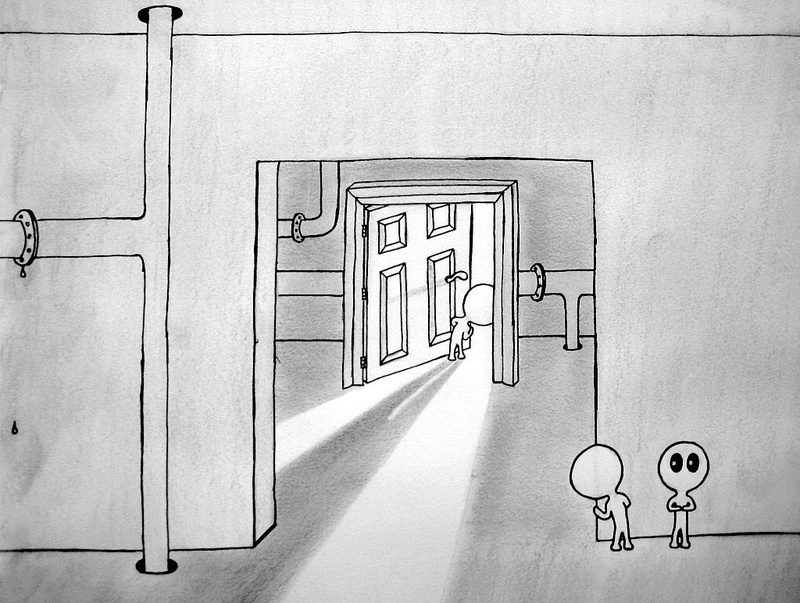 @ Jumpy12: Not really, because the door is leading to a different world. It's just a door in the middle of a dark room, and on the other side it's in the middle of a desert. I see what you're saying, the since the sun isn't facing the door light wouldn't come in, except that it would because it's so much brighter in the desert that the shadow is brighter than the dark room, and also reflected light would be coming in.